Free Library of Philadelphia Halloween Celebrations! The Free Library of Philadelphia is celebrating Halloween on all corners of the city from the South and the North to the Northeast and Center City. Halloween isn’t merely for children to don ninja or superhero attire, nor is it just for re-reading Harry Potter with its apparitions and the very awesome Albus Dumbledore. No, for a select few library staff members, Halloween is a ritual and a way to demonstrate extreme creativity on a shoestring budget. For the past few years, for one afternoon a year, the Fumo Family Library transforms from a bustling hub of literacy into a creepy carnival or a melodious mire, just to name a few. Upcycling is key. 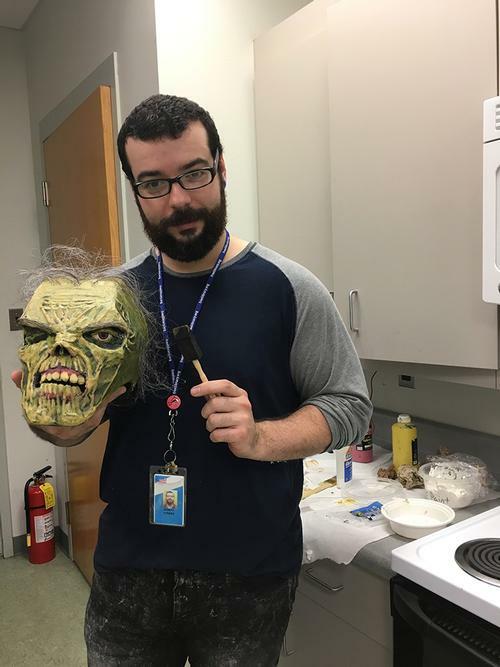 Our special effects superstar is LA, Joseph Torres, a UAarts grad, who converts cardboard boxes sent to the library from book and DVD vendors and leftover props from previous years to create a one of a kind ungodly zombie head, a life-size alligator, or any number of ghastly ghouls. This year our theme is "Urgent Scare," where zombies run amuck and Dr. Butcher will explain the intricacies of inter-cranial dissections. Guests will discover if they are carriers of the mutant disease and a special app will reveal what they will look like as a zombie! We have crafts and games for the little ones, treats, and costume raffles. So, come if you dare on Wednesday, October 18 from 4:00 p.m. to 6:00 p.m. to the Fumo Family Library (2537 South Broad Street). On Wednesday, October 25, from 6:00 p.m. to 7:30 p.m., join the Torresdale Library (3079 Holme Avenue) as they present "Fairy Tale Fright," based on Grimm’s Fairy Tales. There will be an enchanted forest and creepy castle, among other props. Fairy tales featured will be "Little Red Riding Hood," "Hansel and Gretel," and "Rapunzel." This spooky event is not recommended for kids under 9 years old, as it will feature a fog machine as well as scary mannequins. Spooky costumes are encouraged. Of course, we'll have some Halloween treats... or, will they be tricks?! McPherson Square Library (601 East Indiana Avenue) will celebrate with a Halloween parade in the park on October 27. Participants will begin with a mask-making craft in the library for those children who do not already have costumes. The parade will start at 4:00 p.m. Prizes will be given for best costume, funniest costume, scariest costume, best dancer, and more. Everyone will receive candy! On Halloween, school-aged children and teens can get dressed up in Thomas F. Donatucci, Sr. Library's (1935 Shunk Street) dungeon (downstairs) for some ghoulish games, freaky fun, and a costume contest! Judging will begin promptly at 5:00 p.m., spooky stories begin at 6:00 p.m. for all ages. Finally, our Teen Center at Parkway Central Library (1901 Vine Street) will celebrate the holiday on Tuesday, October 31 from 3:00 p.m. to 6:00 p.m. This Halloween, Zombie Prom rises from the dead! Come dressed in your best zombie wares to enjoy macbre music and frighteningly (good) food. Joseph Torres, LA at Fumo Family Library, with his zombie, created with cardboard, glue ,and hair from an old prop wig. 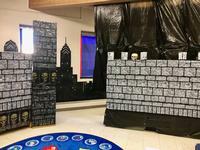 Torresdale Library preps for “Fairy Tale Fright,” based on Grimm’s Fairy Tales. McPherson Square Library is excited about its Halloween Parade! Nice blog. This is a very good blog on . I would like to thank you for all the information you give. Its really important to choose the best make up for look scary in halloween party. So thanks for the information you give. There are also Two great Halloween parties at the Wynnefield library! One on the 30th for Adults and Teens (There will be a costume contest!) and one on the 31st for the kids! 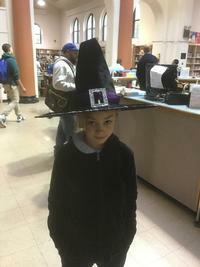 Add a Comment to Free Library of Philadelphia Halloween Celebrations!